The new Berlin Airport (or Berlin Brandenburg International, if you want to get all formal) is a brand new airport that replaces Berlin’s existing airports in June 2012. The new airport is being built next door to Schoenefeld airport (SFX) and is meant to become a major international hub linking Berlin to major foreign cities in ways that the cute old Tegel Airport never could. The new airport will have mix of major international airline connections (flying from Berlin to New York, for instance) as well as all of the low-cost carriers including AirBerlin, Ryanair and Easyjet that currently have hubs. The new Berlin airport will have great links into the city centre with direct rail links and a direct express shuttle. The Airport Express train that already connects Schoenefeld to Berlin central will switch over to the new airport. It currently takes about 30 minutes and runs twice an hour through most of the day. It is clean, large and easy. There will also be a special airport shuttle train that will zoom along in 20 minutes. You’ll also be able to take a taxi to town for about €35 and it will take about 30-45 minutes, depending on the traffic and which part of Berlin you are travelling to. 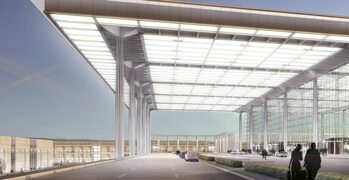 Berlin’s new airport will also be a green airport, that will use rainwater for cooling, geothermal and heat recycling systems to warm it while conserving energy. The construction has also taken care to avoid damaging the environment. Old oak trees (200 years old or so) were preserved by tunnelling under them to lay pipes and cables instead of chopping them down. New homes were also built for bats.